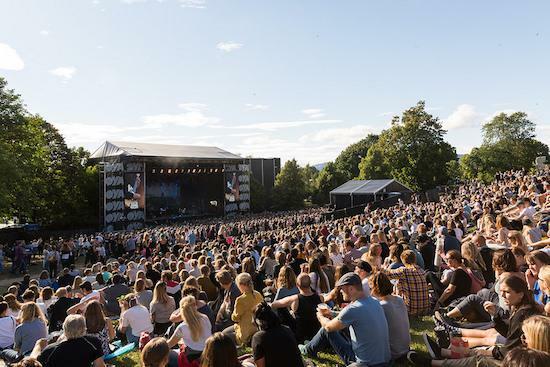 Norway’s top music festival Øya will return again this year to Tøyenparken in Oslo, complete with a line-up featuring Neurosis, Pixies, Angel Olsen, Lana Del Rey and plenty more. Deliberately mixing genres and presentational styles, the festival takes place across five nights and four days, hosting acts in clubs around the main park setting in addition to the three outdoor stages. This year's festival will also take in a special collaboration between Spiritualized and the Oslo Philharmonic, a one-off show that only those at the festival will be able to experience. Taking place from August 8-12, the festival will also see sets from Jenny Hval, Sleep, Feist, Madlib, Young Thug, a number of local Norwegian musicians and many more. For tickets and the full line-up, head here. With the festival now just a few weeks away, we caught up with head of booking Claes Olsen to discuss putting together the line-up as well as the biggest risks he’s taken to create Øya’s exciting and diverse line-ups. Additionally, you can check out a few of tQ’s own picks of acts to see at the festival this year. Obviously artists like Lana Del Rey, Pixies, and Migos are getting a lot of media attention for the festival right now. Which of the more underground artists are you most excited about? Claes Olsen: I have a feeling that Angel Olsen, Thee Oh Sees, Young M.A., BadBadNotGood, Sleep and Vince Staples will be some of the highlights. I’m super stoked about the big Spiritualized show with the Oslo Philharmonic and local choir too. It’s a European exclusive show for the summer. It will be massive. When it comes to Norwegian acts I look especially forward to Wet Dreams, Broen, and Jenny Hval. Jenny will do her biggest production ever at Øya. This lineup is full of must-see acts, and the bane of every festival-goer's experience is the schedule conflicts between some of their favourite artists. Are there any conflicts that we should expect, and who do you recommend prioritising? CO: We try to make the puzzle as good as possible when it comes to conflicts. It's always most difficult with the bigger acts as agents often want their act to be pushed up the bill. Lana Del Rey playing at the same time as Spiritualized will be hard for some. Janka Nabay against Feist or Young M.A. against Angel Olsen will be hard too. My tip is to see 50% of each since the stages are so easy to move between. Of course as a booker you have to find the balance between quality artists and artists that also draw a crowd. What artist have you taken the biggest risk for? CO: Looking back it was a huge risk to have My Bloody Valentine headline the main stage in 2008 (their big comeback year). Seeing them scaring away big crowds at some festivals in months prior to Øya I was a bit scared. But they did an amazing show and people stayed their full set. One of my top five shows ever. In 2014 we decided to put Todd Terje & The Olsens as the Saturday main stage headliner. His biggest show in Oslo prior to this was at a 300 capacity venue. Listening to the album three months before it came out, we thought it was a cool thing to do, and it worked very well. Not many other festivals that I’m aware of put such an emphasis on being environmentally friendly. Is there a special inspiration for this? CO: We decided early [in 2002] to take the responsibility that any companies should take when it comes to environmental issues. For us it was important to use the influence we have to inspire our audience and partners to reflect on what is actually possible to change. I remember being on a panel in London in 2004 at a promoter conference where German and UK festivals booed at us and said the audience doesn’t care anyway. Luckily we had more faith in our audience, and I believe there are very few promoters in Europe denying taking a stand on such an important issue is smart now. More and more festivals are only a weekend long, or even just one day. What’s the benefit of booking a five-day festival? CO: We try not to have genre specific days nor stages, as we love to mix it all up. There are always so many acts we want, especially when it comes to new smaller acts. So it’s great with flexibility and the possibility to make several offers. When it comes to headliners it’s always a fight to get the ones we like, but also good to have different options of days and billing. Below, you can find a few recommendations of acts appearing at this year's festival that we expect to provide standout performances across the festival's five days. Pixies are undoubtedly a band that many in attendance will not want to miss at this year’s Øya. Since releasing their sixth studio album Head Carrier in September of last year the band has embarked on South African, North American, New Zealand, and European tours in relentless support of the project. Since the Boston rockers’ reunion at Coachella in 2004, the band have played shows showcasing music new and old, experiencing a sort of creative rebirth after losing co-founder Kim Deal in 2013 and still making the effort to come out with new records. Ever since their shows have made a turn towards a slightly happier tone, optimistically tingeing the haunting surrealism they are known for in their sets. Read our anniversary piece on Pixies' Trompe Le Monde here. Having already established a reputation for unnerving and commanding live shows, and having just released his biggest breakout album to date Big Fish Theory, Vince Staples is on the top of our list of acts to catch at the festival this year. Gaining an unignorable and absolutely hilarious internet presence through the likes of Twitter and his Reddit AMA, Vince Staples is rising to the status of pop-culture icon and has music with meaning to back it. Writing about his latest album earlier this year for tQ, Tara Joshi said: "Vince Staples doesn’t care for being labelled a rapper, perhaps, but in just 'being himself' he has created one of the finest exponents of the genre this year." Expect him to bring a lot of personality, and some of that fine music, to his appearance at Øya. Read our review of Big Fish Theory here. A Norway native himself, Bech’s rise to fame can be cited as beginning around the time he headlined Slottsfjell Festival’s small stage back in 2010 about an hour south of the site for Øya. With his latest release Echo, the extravagant artist finds a deeper sense of maturity, with popular track 'Waiting' and single 'A Sudden Sickness' bookending the album with vulnerable sadness on a grand scale. A true performance artist, Bech is known for expressing this solemnity with props, artistic sets and highly conceptual choreographed dancing.